Don’t worry I won’t go quoting lines from that song by the Carpenters! A quick glance in the fridge today and I found a gammon steak and some spring onions. These needed using up before the weekends continued DIY spell on the boat so I looked through a number of books and found this recipe from Sally Butchers Salmagundi. 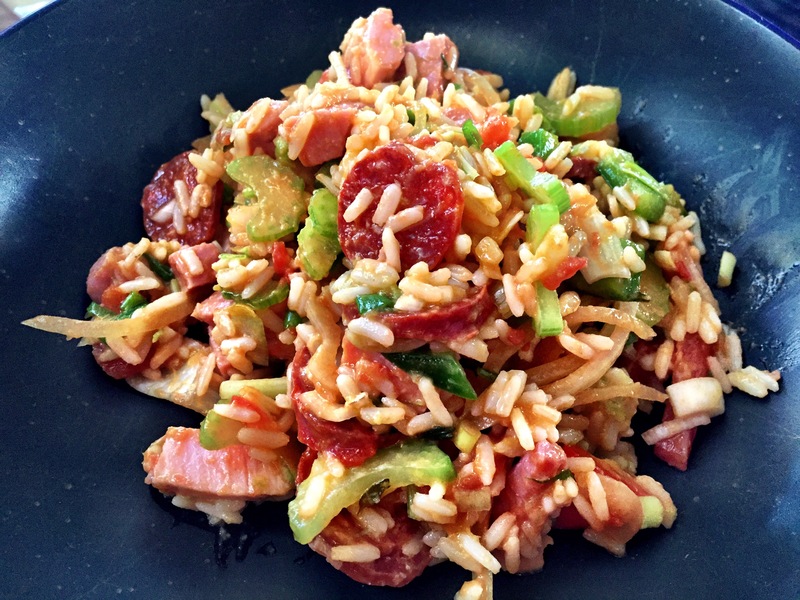 Jambalaya is somewhat similar to a paella. This particular version is served cold and is ideal for picnics, barbecues or outdoor eating. I chose it because the temperature inside the boat has been 25 degrees today and I really didn’t fancy a hot meal. This is pretty easy to make. Boil some gammon in water with a bay leaf and some thyme until it’s cooked, remove the gammon and cook the rice gently in the cooking liquid with some chopped tomatoes. While that’s cooking you have 15 minutes or so to dice some red and green pepper; slice some onion, celery and spring onions and chop some chorizo or other smoky cooked sausage. Also chop your cooked gammon. You also make a dressing of garlic, lime juice, green chillies and rapeseed oil – which I blitzed in my Nutribullet. When the rice is done, let it cool and then mix everything together. That’s it. This far exceeded my expectations. What was just going to be a leftover rice dish turned out to be flavoursome, crunchy, comforting and the sauce was really zingy and lifted it to another level. Fortunately I made twice as much as I needed so that’s tomorrow’s dinner taken care of too! Just as well. We have another floor to sand, dye and stain and lots of other boat DIY tasks to get done done during our unusually commitment free weekend. And it’s going to be a warm dry weekend – happy days!